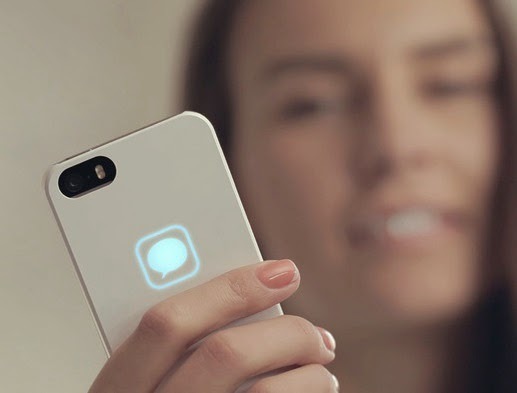 That is no notification light on Apple iPhone, but lunecase made a case in which you can see the notification when you call will receive A call or get a message powered by electromagnetic energy wireless, smart, elegant. It is a most intelligent iPhone cover. The case is known and identifies when you receive a message or phone call before it is even displayed on the iPhone screen. The case displays these notifications on the back of your Smartphone with the help of LEDs using the free energy that is emitted by the device. Lunecase does not have any kind of batteries inside and any connection to your Smartphone, you just have to snap case on your iPhone and it will work like a charm only operates with GSM network iPhone. For Pre-Order or learn more for this case go to Kickstarter project.